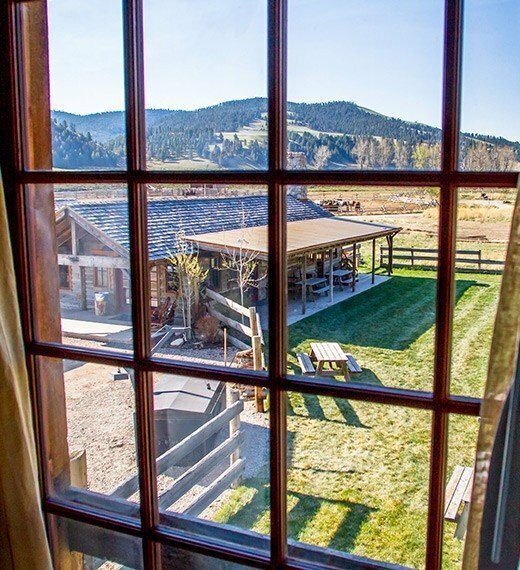 Our remodeled 19th-century barn houses an important piece of Ranch at Rock Creek history. 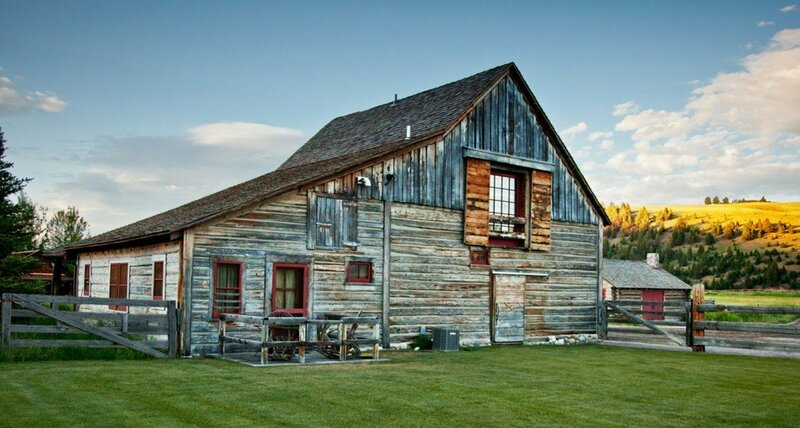 Often billed as “rustic,” a barn was actually the original rural luxury. It cost more than a home and stored a ranch’s wealth, in the form of livestock, equipment and feed. This original structure was lovingly restored to three unique accommodations that can be booked separately or in concert to house a large group. The Historic Barn is located near Camp Roosevelt and the Blue Canteen. A shared lower porch looks out over a lawn of wildflowers and native grasses. The three accommodations can be reserved together as three-bedroom family suite. 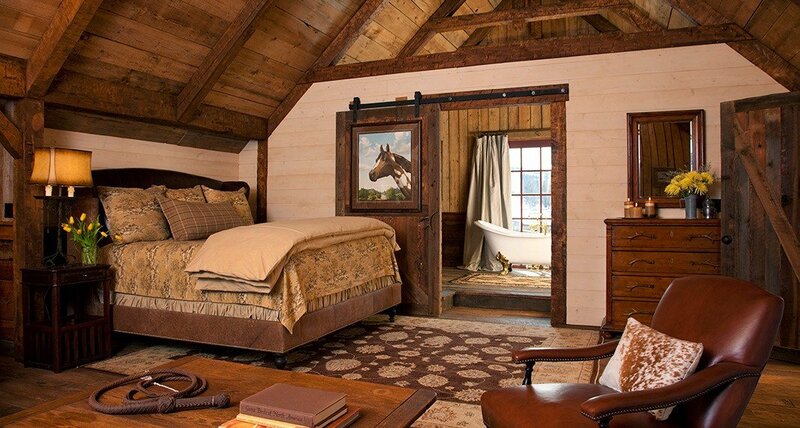 Once the hayloft of the original homestead’s barn, the 700 sq. 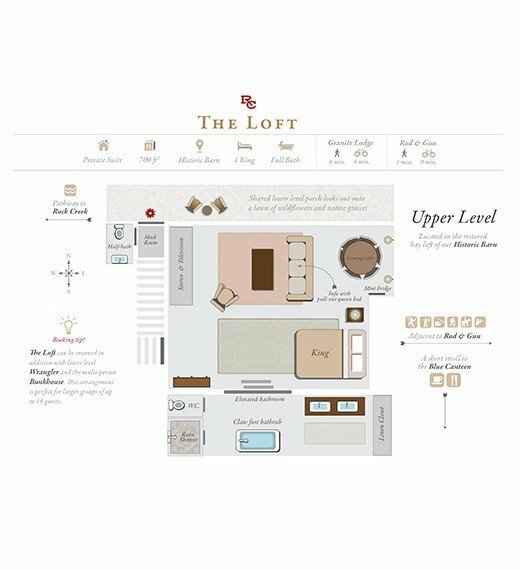 ft. Loft contrasts the original exposed-rafter ceilings with luxurious amenities. The combined bedroom and sitting area offers a king bed and queen pull-out sofa. 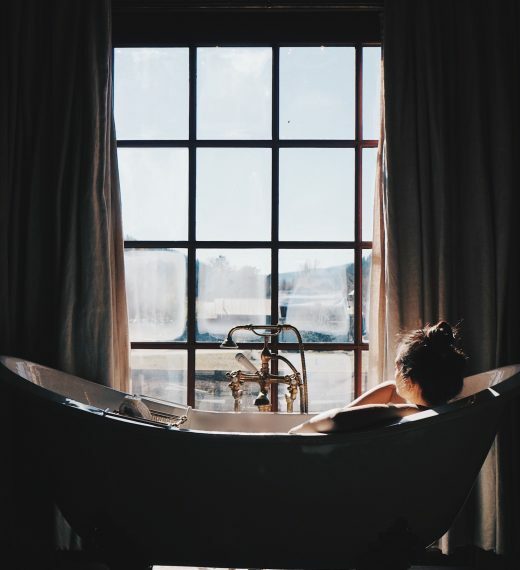 The bathroom features a marble tiled shower, with a built-in bench, and an elegant two-person slipper tub overlooking the wildflower lawn and Pintler mountain range. A large television, DVD player, indoor gaming table and outdoor porch make it an ideal place to socialize with friends and family. Enjoy pastoral elegance with chandeliers, leather upholstered furniture and woven textiles set against rough-hewn wood and natural light. Standard occupancy is two guests, with a maximum of four. 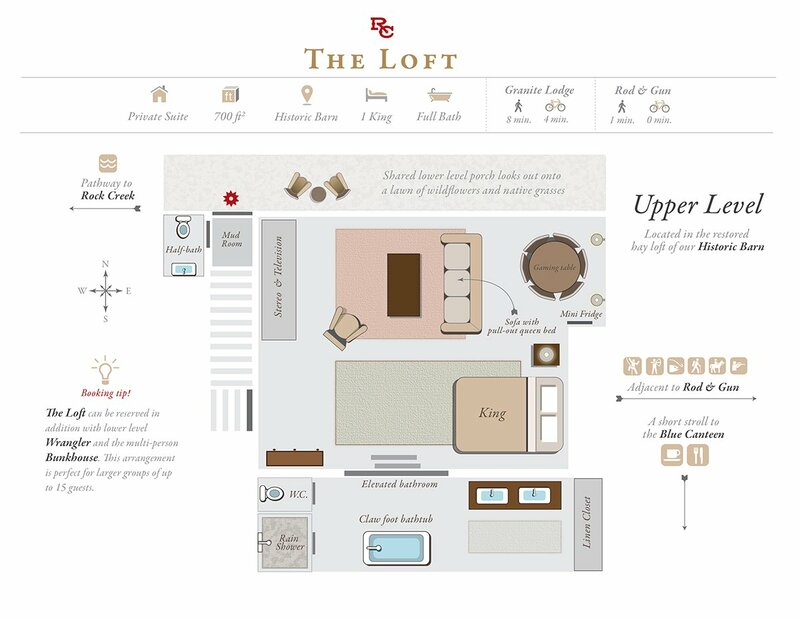 Loft can be reserved in conjunction with Wrangler and Stables to house groups and family reunions of up to 15 guests. 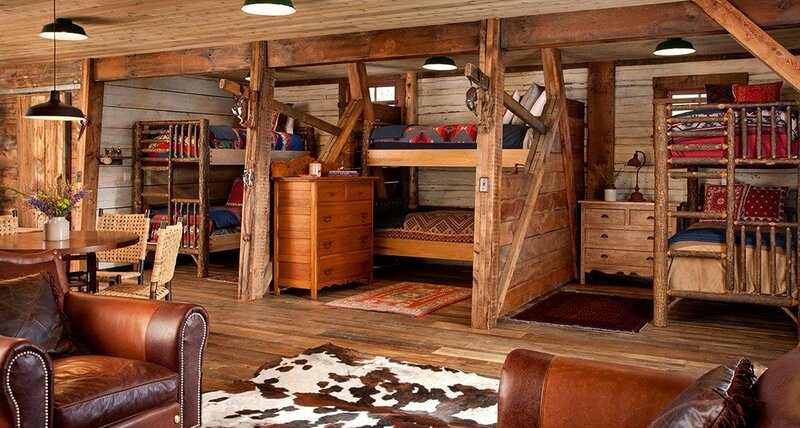 Once an actual horse stable for the working ranch, Stables was restored as the quintessential Western bunk room. With three sets of twin bunk beds and a queen pullout, there is space for a family adventure or children’s sleepover. This accommodation is beloved by family reunions and group vacations, because children are safely tucked away in the Stables, while couples take private, but adjoining accommodations, Wrangler or Loft. 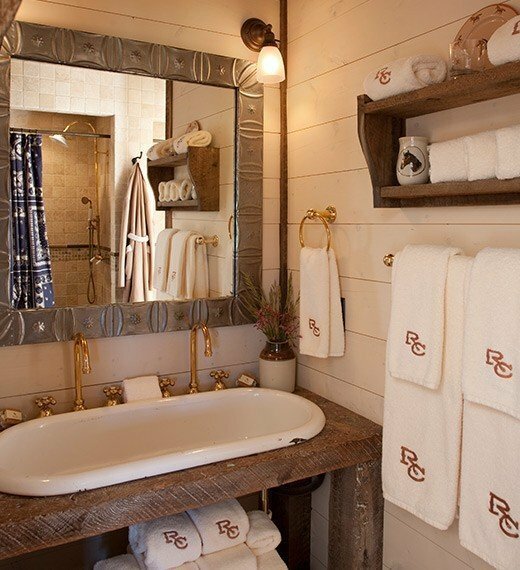 Stables offers a spacious full bathroom with two separate showers and a cozy sitting area with a game table and ample seating for socializing. Outside, relax on the covered porch enjoying sweeping ranchland views or strike up a family game on the manicured lawn. 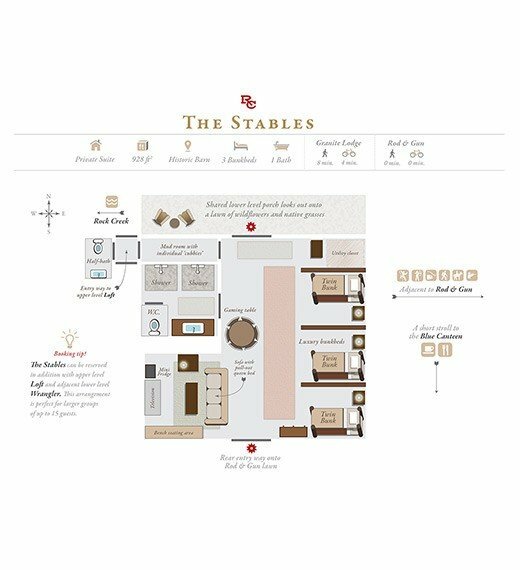 Stables is a 928 sq. ft., one-bedroom accommodation. Standard occupancy is three guests, with a maximum of eight. 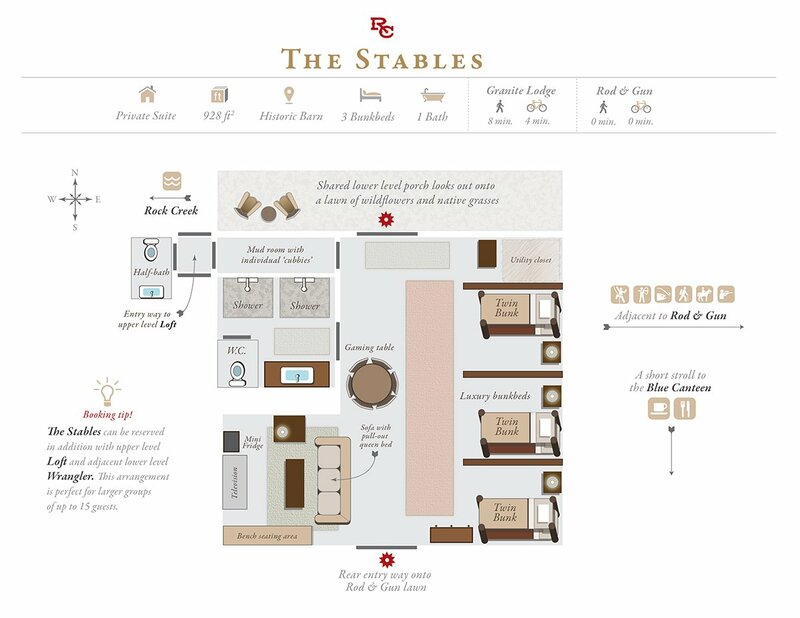 Stables can be reserved in conjunction with Loft and Wrangler to house groups of up to 15 guests. 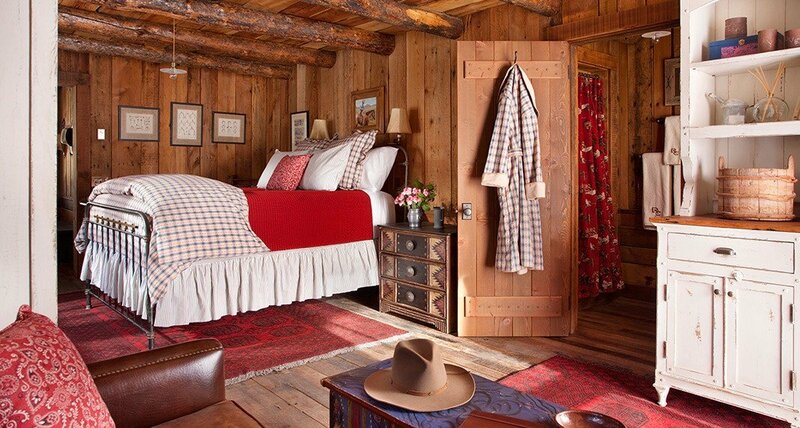 Once an essential tack room in the original 19th-century barn, Wrangler is now a cozy couples hideaway in the corner of the historic building. 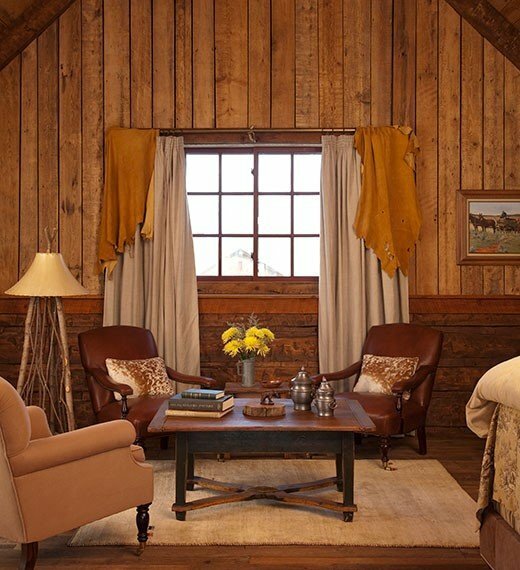 This accommodation can be a private room or part of a booking of the entire barn for a group or event. 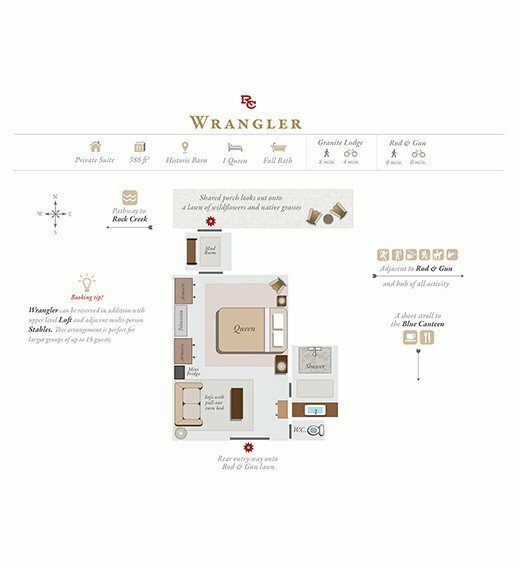 Wrangler features a combined bedroom and sitting area, as well as a twin pull-out sofa. It has a full bath and separate W.C. The room is complete with a large television, mini-refrigerator and two entrances. The shared porch just outside offers views across the meadow, with the sounds of the creek murmuring in the distance. Standard occupancy is two guests, with a maximum of three. 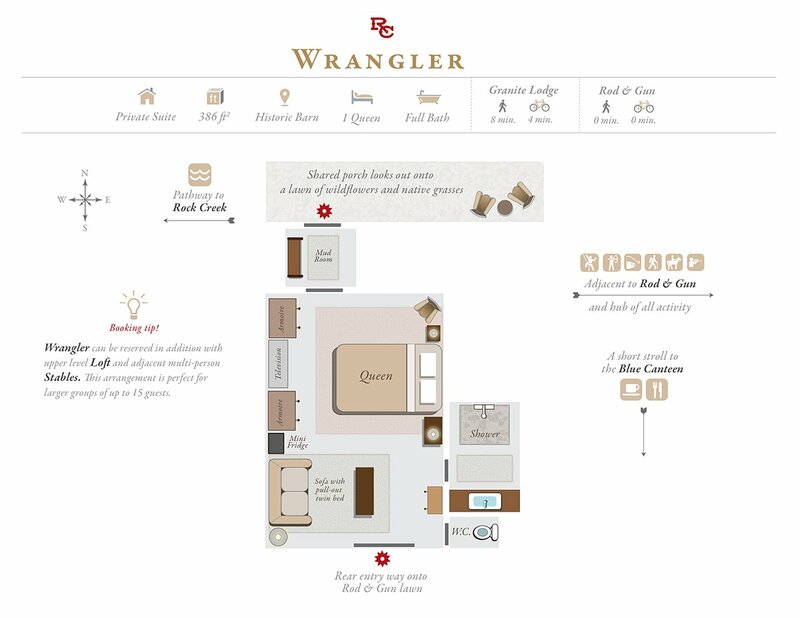 Wrangler can be reserved in conjunction with Loft and Stables to house groups of up to 15 guests.